In this article we describe the use of a weblog (blog) project that was incorporated into an undergraduate preservice teacher education course that addressed diversity and multicultural education. To explore the efficacy of the project, we analyzed its implementation using an action research framework. We found that the project increased the preservice teachers' exposure to new issues and ideas in multicultural education. In the discussion section, we describe changes that were made to the project as a result of its first iteration. Additionally, we raise several questions that must be considered when using blogs in multicultural education courses and teacher education programs. Wassell, B. & Crouch, C. (2008). Fostering Critical Engagement in Preservice Teachers: Incorporating Weblogs Into Multicultural Education. Journal of Technology and Teacher Education, 16 (2), 211-232. Waynesville, NC USA: Society for Information Technology & Teacher Education. Retrieved April 21, 2019 from https://www.learntechlib.org/primary/p/22907/. Bennett, C. (2003). Comprehensive multicultural education: Theory and practice (5th ed.). Needham Heights, MA: A l lyn and Bacon. Brown, E. (2004). Overcoming the challenges of standalone multicultural courses: The possibilities of technology integration. 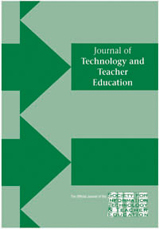 Journal of Technology and Teacher Education, 12(4), 535-559. Gay , G . (2000) . Culturally responsive teaching: Theory , research and practice. New York: Teachers College Press . Gay, G. (2005). Politics of multicultural teacher education. Journal of Teacher Education, 56(3) , 221-228. Nieto, S. (2004). Affirming diversity: The sociopolitical context of multicultural education (4th ed.). New York: Allyn and Bacon. Schoorman, D. (2002). Increasing critical multicultural understanding via technology: “Teachab le moments” in a university school partnership project. Journal of Teacher Education, 53(4), 356-369. Swartz, E. (2003). Teaching white preservice teachers. Urban Education, 38(3) , 255-278.